Pioneers in the industry, we offer intelligent transport system and automatic traffic counter & classifier from India. Intelligent Transport System (ITS) is designed for the urban / state / private road transport organizations (public and private RTCs). 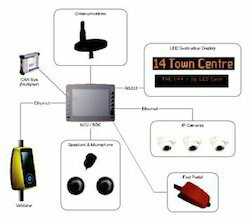 The system consists of a backend and a hardware component to provide an integrated solution for the driver console unit, security cameras, electronic ticking machine, passenger information system and vehicle tracking system. ITS provides a single solution for transport companies to schedule and monitor buses with the help of advance technologies such as GPS, Wi-Fi and GPRS. ATCC keeps a count of vehicles for a specific highway segment .Along with this the vehicles can be classified according to their classes. Passive Infrared or Radar technology is used for automatic traffic counters and classifiers. Acquisition and processing of traffic data is crucial for instant management of traffic flow. To maximize the capacity of highways for instance, operators can use variable speed limits in function of traffic volume to prevent traffic jams from occurring and instead keeping the traffic flowing albeit at lower speeds. Continuous traffic monitoring efforts are carried out in several countries to understand seasonal, day of-week, and time-of-day traffic volume patterns. With improved data collection equipment, continuous data can also be used as input for traffic management systems and other operational purposes. Warning messages concerning road and traffic conditions just before the vehicle leaves the toll plaza. Looking for Intelligent Transport System Main ?